It was then that somebody here in the office mentioned the Trees For Life project. Trees For Life plants trees in The Caledonian Forest. Trees for Life helps nature to restore in the Scottish Highlands and helps people reconnect with their spirit, with hope and with the land. The Caledonian Forest once covered a large part of the Highlands as extensive stands of majestic Scots pines, interspersed with birch, rowan, juniper and aspen trees. It was the UK's equivalent of the rainforest but has been reduced to just a tiny fraction of its former range. Most of the surviving forests now consist of old trees reaching the end of their lifespan. In 2008 Trees for Life purchased the Dundreggan Estate, an area of 10,000 acres of wild land near Loch Ness to establish a major forest restoration programme. To date the conservation volunteering charity have planted over 1.6 million trees! Amos Beech contributed 474 trees to date. 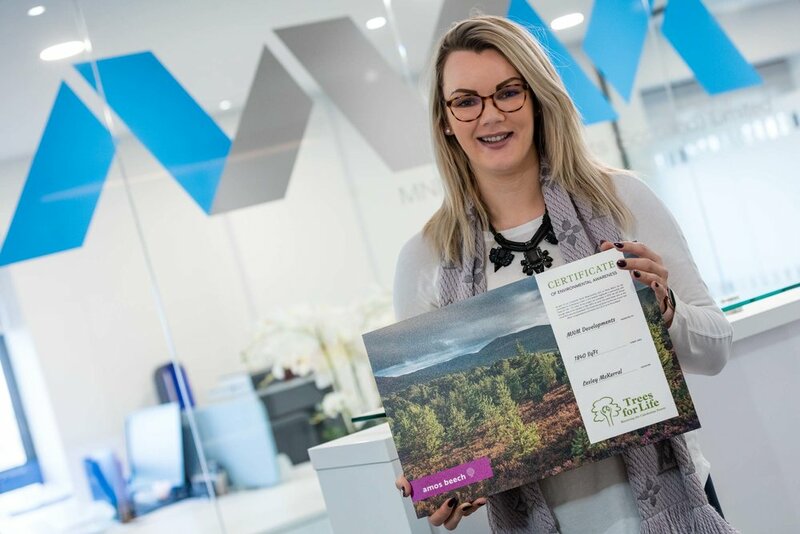 Under the slogan ‘every little helps’, we here Amos Beech started our own grove in August 2017 and are proud to have recently added 52 trees for MNM Developments and Tours by Locals. MNM develop high-value, luxury properties that respect and enhance their surroundings and have a minimal environmental footprint. We designed and fitted out their 1846 sq ft of new office space in Leith Edinburgh. Michaela Teague receives the certificate for 24 trees. Tours by Locals brings local people with their knowledge and expertise together with travelers who are looking for an authentic cultural experience. We designed and fitted out their 2153 sq ft of new office space in Glasgow. Paul Melhus, CEO and Founder of Tours By Locals, receives the tree certificate (28 trees) from Kit-Har McLaughlin, interior designer @Amos_Beech, during a great office opening party in January 2019. Unsurprisingly, the tree planting scheme is very well received by our clients and we feel well doing it, so also this year we will be planting 13 trees per 1000 sq ft of interior design, office fit-out and furniture project. But did you know that you can contribute yourself?